Are they waiting for more funding to start this research? Is the government funding this research? 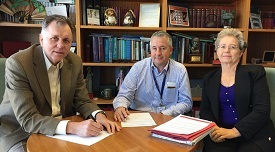 I find it very surprising that the government isn't jumping to fund this research since it's much needed and it's being lead by professor Barry Marshall who is a noble price winning researcher and I even read an article online on how his research has saved the Western Australian government and other governments around the world so much money in health. I can't send a link on the article but if you search Professor Barry Marshall on google and look at the news section it's on the WA today site.